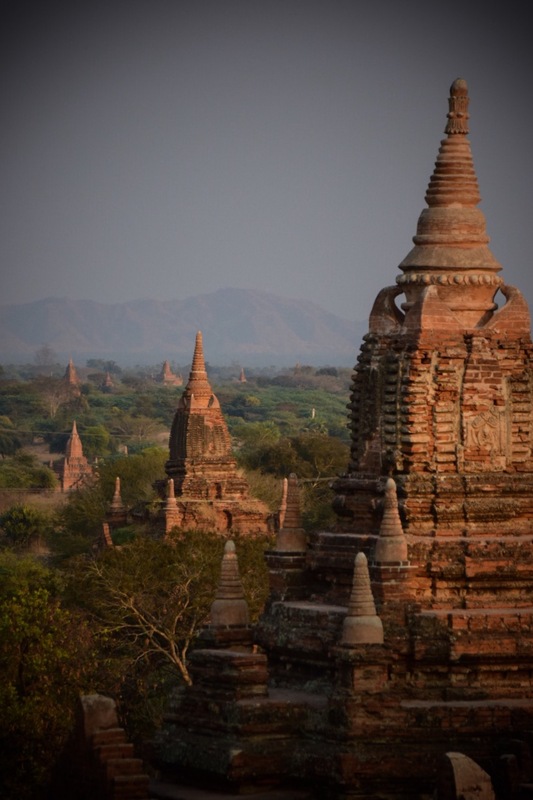 Myanmar or Burma, whichever you please, such a pure country and society. Financial poor yes, but incredibly rich in culture and happiness. There is little wealth divide and families, children and village communities live a quiet and happy life, away from the pressures of the western world. 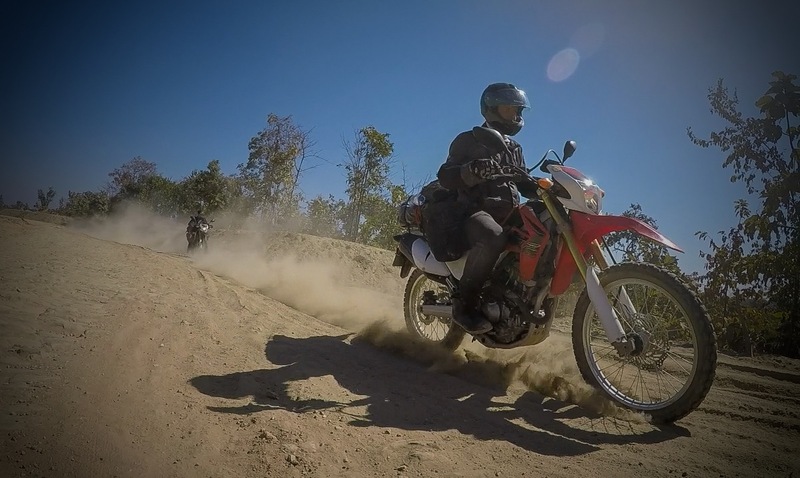 The trip took us from Mandalay, going West over the dry and sandy plains towards Chin State, Myanmar’s mountain region and predominately Christian. Myanmar has been on the radar for a while and I’ve always wanted to do a decent motorcycle trip. 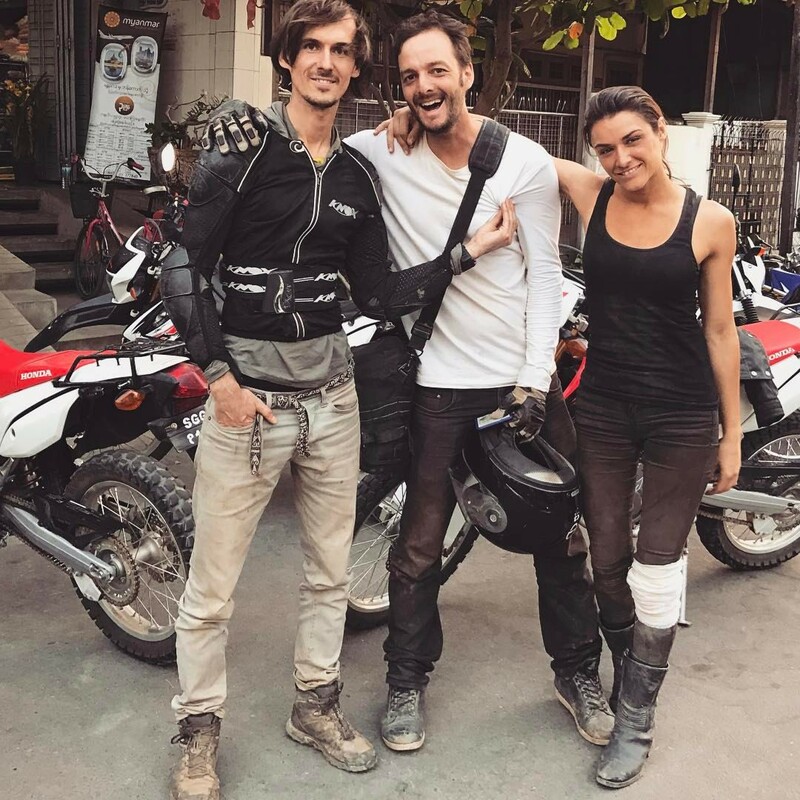 My friend had been to check out Myanmar in 2013 and really wanted to return with a couple of like minded adventurers, willing to get well off the main roads and into the real lives of the people and cultures living there. Eventually, we found the tunnel preceded by abandoned station buildings and sidings. We ventured inside around 5pm hoping to reach the other side and camp before sundown. It was slow going over the wooded sleepers whilst bats flew overhead. Approaching the end of the tunnel it was flooded by hundreds of them as they appeared trapped between the light of dusk and our engines creeping closer. The following day we worked our way to Kale (pronounced “carl-ay”) encountering many different bridges and river crossings some of which we braved and others sending us with our tails between our legs! Approaching Kale on good roads, we were maybe 2 hours out and should have arrived before dusk. We decided to avoid riding at night as there are a number of trucks that continue to drive into the evening without lights. We passed over a large bridge lined with unused tram lines. Kachina caught her tyre inside one and was immediately catapulted to the floor, directly onto her knee cap. 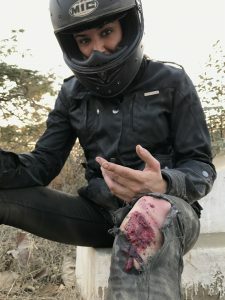 In hindsight and for future trips, I for one, will be wearing knee protection! In true Myanmar fashion, locals stopped to help immediately and escorted us to a local doctor who cleaned things up. A more worrying injury however was Kachina’s thumb which looked broken and could have spelt the end of the trip. Being a stunt women, starring in many an action film, she is one seriously tough lady and was straight back on the bike making our way, in the dark, towards Kale! 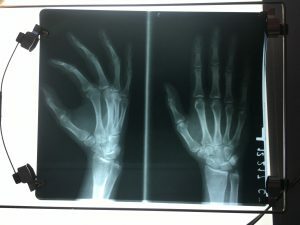 The following day a quick X-ray suggested it was either not broken, or if it was, not badly. The trip goes on! Summit of Mt Kennedy, the huge Pagoda was surrounded by bright red petals! Kale sits at the foothills of the Chin Mountains and is the gateway to Chin state. We quickly ascended up steep hairpin roads, the temperature nicely dropping with every hour. The riding was world class! Empty roads with challenging sandy corners mixed with sections of fast tarmac. 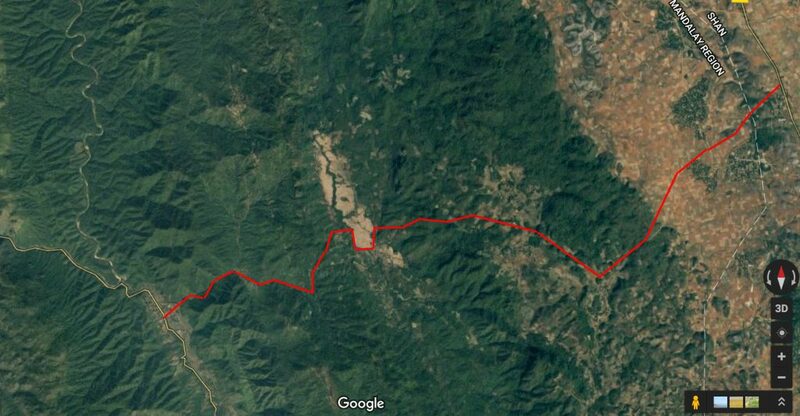 Our aim was to get up Mount Kennedy and still make it to Tedim, a major town of Chin State, by dusk. We did make it to Tedim and we did make it to the summit of Kennedy, but not by dusk! For all our efforts not to ride at night, we were failing badly on that one! Interestingly, Mt Kennedy has a huge Pagoda on the summit, even though Chin State is almost entirely Christian. Just a few hundred yards from the Pagoda, although not on the summit, is a Christian chapel, clearly showing mutual respect between the beliefs. Summits and mountain tops are important to the Buddhist religion so it is possible that the Christians conceded the summit out of respect. From Tedim we moved South through the mountains on variable roads and paths with no real itinerary, tents at hand, should we find a suitable spot. Towards the end of the day we passed over a large river and looking upstream could see it curving its way up into the mountains and wilderness. We found our way down to the riverbed and picked our way through boulders to find a glorious little river beach to spend the night by firelight on fine sand. We were now well on the way to reaching our goal of Mount Victoria. The highest mountain in Chin State at 3053 but a long way short of the highest in Myanmar since the country boarders with the Himalayas in the far North. This was partly due to some warnings we had about some potential fighting in some regions. The roads again varied enormously and many of the corners were covered in deep sand which made progress slowly and dangerous. A few slips and slides were had! We were now well on the way to reaching our goal of Mount Victoria. The highest mountain in Chin State at 3053 but a long way short of the highest in Myanmar since the country boarders with the Himalayas in the far North. To reach Mt Victoria we had to drop down to the plains again before working our way back into the mountains. This was, in most part, due to some warnings we had about some potential fighting in some regions. The roads again varied enormously and many of the corners were covered in deep sand which made progress slowly and dangerous. A few slips and slides were had! Moving through the mountain villages we did notice an interesting, but much more skillful, form of volleyball. One of the most notable things of Chin State is the simple yet delicious food. 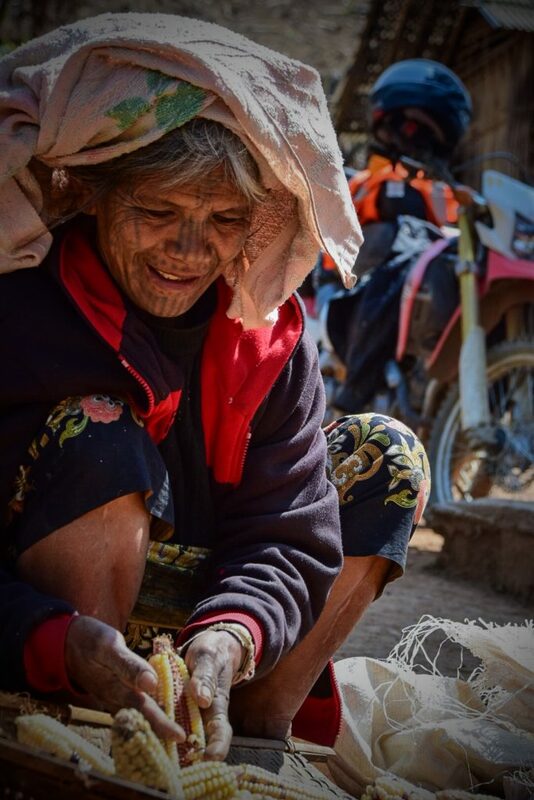 In fact, food across Myanmar is excellent but especially so in the Chin Mountains. We found repeatedly that we could not get the same type or quality of food in towns. The only way was to eat in small shacks, often an extension of someones home, along with whatever other locals were feeling hungry at the time. Bagging a harvest of chilli peppers, sold at market and used across the country. These are reliably dotted along the road side throughout the region but clearly not aimed at travelers. We gestured the international symbol for we’re hungry by bowing your neck, pinching your fingers and putting them to your mouth. You’d pay around 50p – £1 for a meal made up of various soups, vegetables, rice, and if you’re lucky, a little bit of meat. 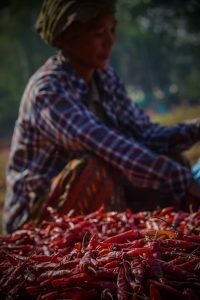 Chillis were often used were used to give it all flavour but in a really simple and healthy way. It is nothing like the food I have tried in other parts of Asia. I have since tried to recreate a Myanmar feast at home in England but failed miserably. Today we are so obsessed with complex cuisine that we fail to use a few core spices and simple ingredients in an effective way. Moving down onto the lowlands again, we weaved our way through amazingly lush farmland with a variety of crops and remarkably good roads, not even marked on our maps or Google. In some areas we would wind our way through enormous fields of sunflowers, tended by hand and most likely sold to go to the major cities like Yangon or Mandalay perhaps? 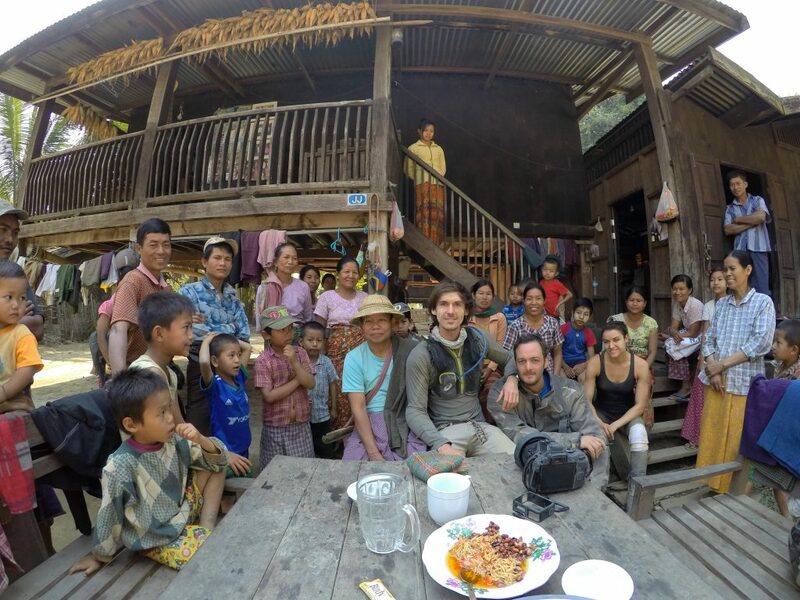 A mechanics son, wearing Thanaka, who helped us fix our foot pegs which we bent the week before in the tunnel shortcut! 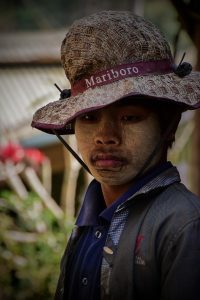 Another thing worth mentioning is the use of a type of face paint called Thanaka throughout all 5 regions we visited, regardless of temperature or religion. Thanaka is paste formed from rubbing the bark of the Murraya tree on a rock with some water. The paste is then most commonly applied to the face of women and girls where it then drys and looks vaguely golden. Some apply it in stylish streaks and others just apply it to the whole face. It prevents sunburn and also acts as a moisturiser. Maybe the key to beauty of the Myanmar girls and youthful looks? Whilst taking a short cut we came across a lovely little village, well away from any roads, where a family invited us to have tea with them and also showed us how to use the Thanaka bark! The following day we began our ascent again into the Southern Chin Mountains towards Mt Victoria. We made good progress climbing steeply to the town of Midat and pushing on up the mountain through dusty trails and river crossings. The Southern Chin mountains are famed for the women with tattooed faces. It is said that Chin girls were the most beautiful in all Asia and the parents of young girls would have their faces tattooed as a way of becoming ‘ugly’ to the neighboring Burmese king and Princes to avoid being kidnapped. Others say they were tattooed to identify their tribes in the event they were kidnapped by rivals. For additional reading there is a good article here and Google Images has plenty of photos! You would be hard pushed meet one of these women in real life and not part of a tourist show. However, our route by bike took us to villages that were inaccessible to cars and many 4×4 vehicles. One single track took us down to a small community where two families were working hard stripping corn and packing bark. You can clearly see the tattoos on the ladies face. I can’t guess at her age now but you can tell she was a beauty in earlier life. We spent a few hours there helping two families with some of their jobs and shared some laughs and mutual curiosity. The bark in the video below is dried on roof tops and then selected by tapping it and feeling for moisture. If it appears hard enough then it is good to be packed up. I think I understood that it would be made into powder, sent to Yangon, and then sold into the western cosmetics industry. 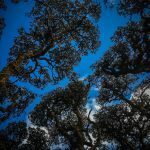 Looking up into a thick canopy of trees. Click to enlarge. Continuing up the mountain the trees changed into thick rainforest. 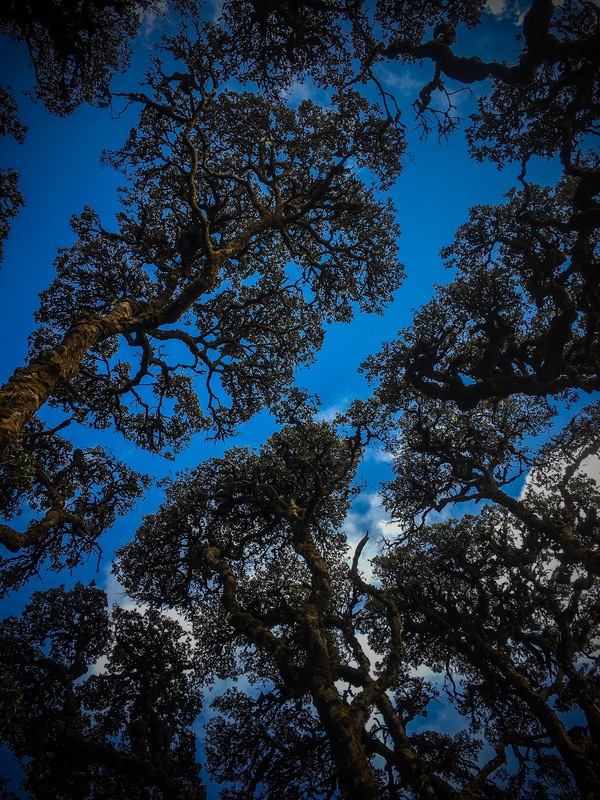 We swept along good tracks until a single track extended up towards the summit and the trees gave way to large flowering shrubs with brilliant red flowers. 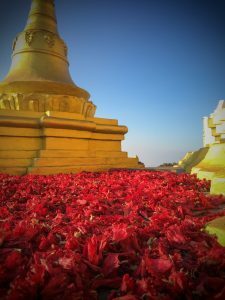 Maybe the same flowers whose petals line the floor of the Pagoda on the summit of My Kennedy the week before!? We didn’t think it would be possible to reach the summit with our bikes but it turned out to be relatively easy. A camping spot was found and a sheltered place for a fire. We learned it could drop below freezing at this altitude, compared to the 35 degree heat on the plains the day before. The sunset was fantastic but the sunrise was even more spectacular. As the sun rose, it lit it up a Golden Pagoda perfectly, through a gap in the ridge. You could mistake this for coincidence but later in the trip we figured this might be intentional. 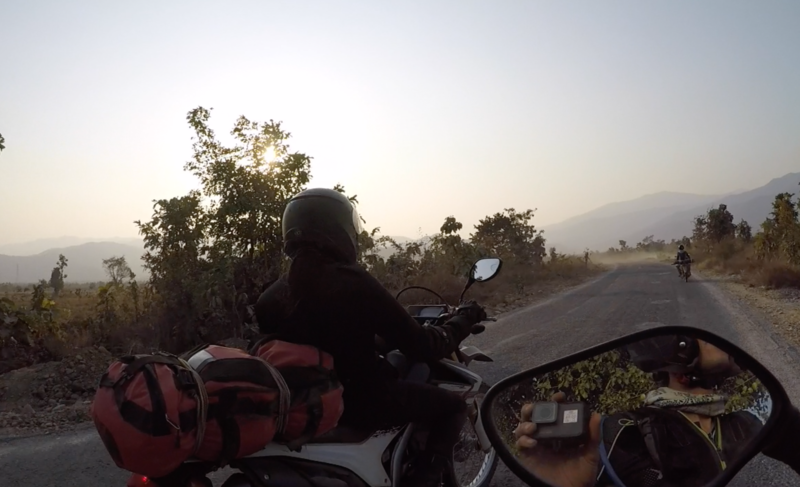 We had now achieved what we came to do and ride through Chin State from North to South but we still had about a week left. Going further south was not advised due to conflict in Rakhine State between the Buddhists and Islamic majority. 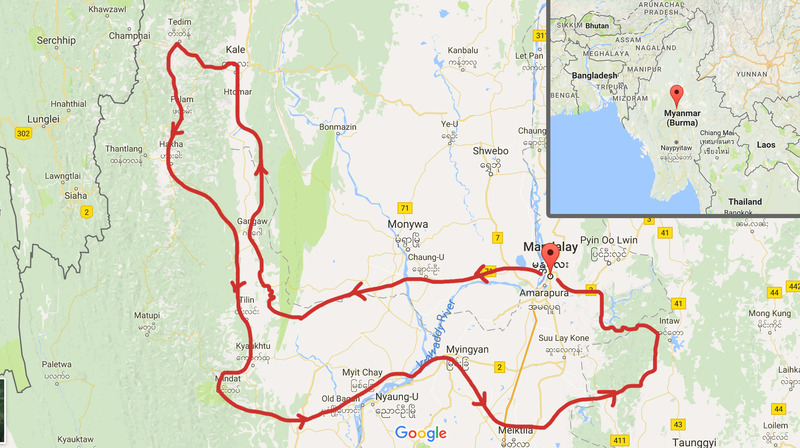 We descended back to the lowlands and worked our way across to Began through the Magway and Mandalay Division, the two hot dust bowl regions in the center of the country. The low lands are littered with Pagaodas and temples. 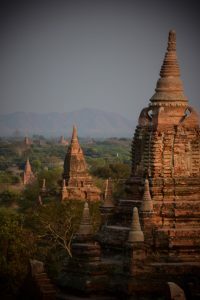 The majority of travelers head to Bagan but all over these regions are thousands more to see and explore away from tourists. Interestingly, the local people gain merit for the afterlife by building a temple but no merit is gained from renovating an old one. As such, there are ancient and crumbling temples everywhere you look. 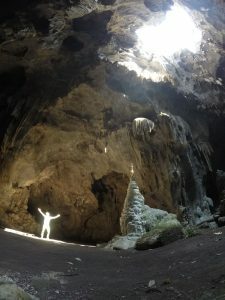 Many are accessible only by bike or a long hike so we were in for a real treat to visit many, unlikely to have even been seen or visited by a westerner. After 2 weeks of not seeing another white person, we were now swamped by the hordes of tourists that come only to see Began and Inle Lake. 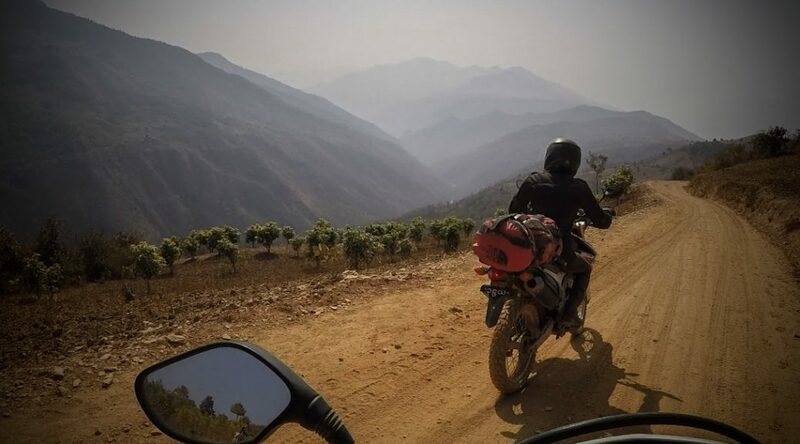 We quickly passed through the sweltering region to gain altitude and the slightly cooler temperatures of Western Shan State. We stuck to our trusted strategy of route finding by using Google Satellite images and roughly pick out single track paths through the trees. 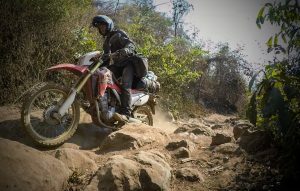 Off road Google sat route into the higher plateau of Shan State via the forested mountain passes. Navigating this way has risks. 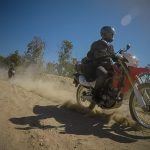 Mechanical help for a broken bike or medical help in Myanmar is not exactly easy to come by, and going well off road, deep into forests or mountains, exaggerates theses risks significantly. However, the rewards in the people we met and amazing things we came across, made it entirely worth while. Looking at the Google sat image above, we saw a community, hidden away in a valley set among the foothills and rain forests, which seemed to be entirely cut off. We figured there must be some interested people living there and some sights to see, so off we went! Below the video shows our varied route and a family we met there who showed us how they light a bulb with a small water generator. 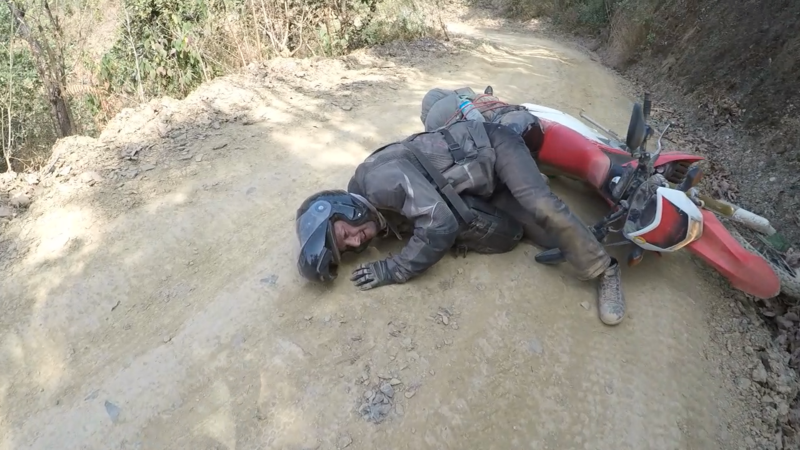 After this nice encounter we continued on our, enjoying some of the sweeping tree line roads of Shane State, in a much cooler climate at around 700m above sea level. The forests now gave way to farmland of olives and vines with the occasional village. It was slightly reminiscent of Southern France or Italy. It was getting time to head back to Mandalay and we once again decided to ‘bee-line’ it, via a satellite image, back across the Shane State foothills through the rain forest; this time slightly further North, roughly parallel with Mandalay. 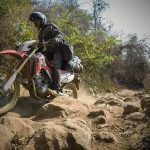 These proved to be the toughest and most technical terrain we’d encountered, with steep dirt tracks that required a committed entry whilst engine braking was the only way to negotiate the rocks and deep sandy patches. Among the difficulties and route finding we stumbled, by pure chance, across a cave system which, if not for the relief from the 35 degree heat that day, looked particularly intriguing. Entering through a small tunnel, we discovered an enormous network of caverns and passageways, each chamber with a shrine. It was here that we figured that sunlight had a significant part to play in where some Pagodas and shrines we places. In both of the main chambers, light shone through a collapsed roof, perfect clipping the tops of the shrines, just as it did on My Victoria at dawn. Working our way down out of the foothills we’re now not far from Mandalay. The roads become busy with trucks so we turned off and picked our way through the farmland between irrigation channels. It was lovely countryside, with people tending their land and animals. It was all going well until we had to cross the Myitnge River and the boat working its way back to our side, against a strong current, was being bailed out with an old pan en route. “That’s ok” we thought, “We’ll go one at a time”. The boat owner had a different idea which was that he’d shuttle all three bikes, all our gear and ourselves in one go. In grunts, nods and various international gestures, we settled on two bikes max. 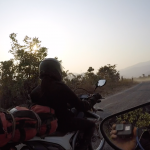 Having survived the river crossing, it was a relatively short ride back into Mandalay. We made it back in one piece. What a trip. Only 3 weeks but a years worth of experiences and much learned. It wasn’t long before plans of a trip into the Northern state of Kachin were being discussed! Will this country remain as pure and untainted as what we witnessed? Any sign of military oppression is either far exaggerated by the western media or it has dissipated rapidly since the election of the NLD and Aung San Suu Kyi. We encountered no military presence in all four regions we traveled and noone had any issues talking about politics. Anyhow, regardless of politics, I cannot help feel that now international investment is coming, the way of life will disappear and the wealth divide will grow. As one hotel manger explained, he and many like him are getting into business, but loosing the time to meditate. Meditation is a significant part of the Buddhist faith, building mindfulness, modesty and happiness. He went on to explain that he now can’t achieve even a basic meditative state as his mind is full of distractions, anxieties and deadlines.